Japan, Korea and Chinese Taipei continue to be ranked top 10. 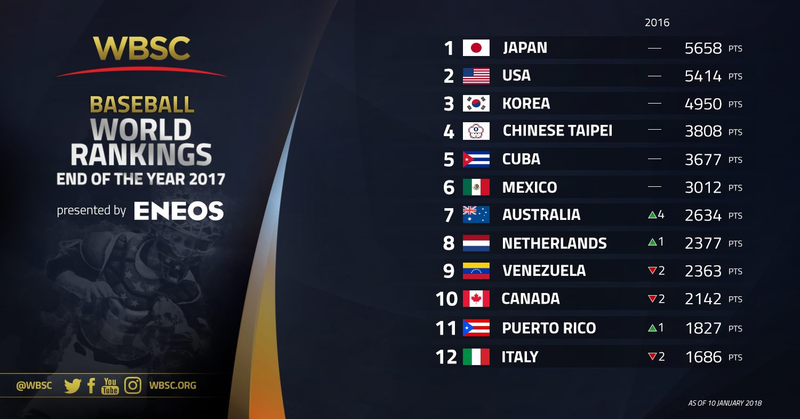 January 10, 2018 LAUSANNE, Switzerland -- The World Baseball Softball Confederation (WBSC) today unveiled the final 2017 standings in the WBSC Baseball World Rankings Presented by ENEOS, which weigh a country's National Team performance (from U-12 to Professional) in WBSC-sanctioned international competitions over a four-year period (2014-2017). Japan remains the top-ranked nation for a third straight year, a position held since November 2014. USA Baseball squads, however, were the most successful in 2017, sweeping the world championships -- the U-12 Baseball World Cup, U-18 Baseball World Cup and World Baseball Classic -- to earn a record high 2,127 annual ranking points. The Top 12 nations in the 2018 end-of-the-year WBSC Baseball World Rankings will qualify for the WBSC Premier12 2019, the men's professional baseball National Team global championship and Olympic Games Tokyo 2020 qualifier.